The Board of Governors of the University of Calgary has selected Dr. Ed McCauley, PhD, as the university's ninth president and vice-chancellor. Currently the university’s vice-president (research), McCauley will move into the role on Jan. 1, 2019, succeeding Dr. Elizabeth Cannon, PhD. McCauley’s selection follows a rigorous national and international search that began earlier this year and was led by a Presidential Search Committee comprised of board, student, faculty, staff, and alumni representatives. The search process included input from the campus and broader community on the attributes of the next president and the university’s priorities. After a thorough assessment of candidates from around the world, the committee recommended Dr. McCauley to the Board of Governors. McCauley is one of the world’s foremost scholars in the field of population ecology. Originally from Ottawa, he arrived at the University of Calgary in 1985, serving as a professor in biological sciences and Tier 1 Canada Research Chair until 2009. He then relocated to the University of California, Santa Barbara (UCSB) to take on a professorship in ecology and evolutionary biology, and the role of director of the National Center for Ecological Analysis and Synthesis. 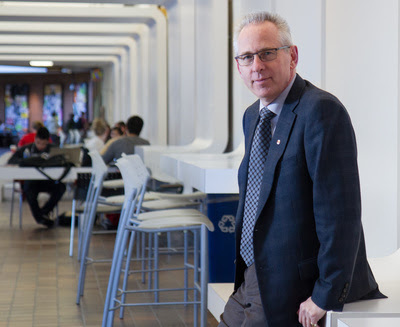 McCauley returned to UCalgary in 2011 as vice-president (research), guiding strategic research initiatives and creating support systems to enable the university to progress quickly on the national and international stage. McCauley earned his BSc and MSc from the University of Ottawa, his PhD from McGill University, and was a postdoctoral fellow at UCSB. A fellow of the Royal Society of Canada, he has been a board member for Mitacs, TRIUMF, the Pacific Institute for Mathematical Sciences, and Compute Canada. Most recently, McCauley served on the Leadership Council for Digital Research Infrastructure and the Research Council for the Canadian Institute for Advanced Research. An interim vice-president (research), to begin Jan. 1, 2019, will be announced in the coming weeks.